Roz is a sexagenarian woman, with salt and pepper hair and blue eyes. Her drooping chest is generous but cannot hide her age. She keeps a neat appearence with lipstick and polished nails. She wears a brass‐colored sweater and a black skirt. Her half‐moon glasses never leave her, as well as for her pearl necklace and earings. Lastly, a badge with her name written on it is attached to her sweater. Roz is charming although a little abrupt in her relationship with others. She doesn't hesitate to use pressure tactics to achieve her goals. She is receptionist at Summerville clinic. Everything that comes in and out of the clinic goes through her. 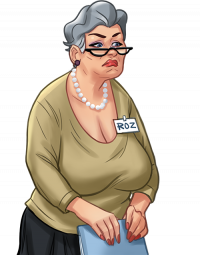 Roz creates a privacy moment in the storage room to receive what she is really expecting from the main character.